Amazon’s Kindle Fire tablet, widely viewed as the only real challenger to Apple’s iPad is out in the wild. Some folks love it. Some hate it. But it goes without saying most are curious about it. Anyway for those who got the device have been putting it through the paces. Online video hosting platform company, Ooyala processes more than 1 billion analytics pings per day, reflecting the viewing behavior of over 100 million global unique users. 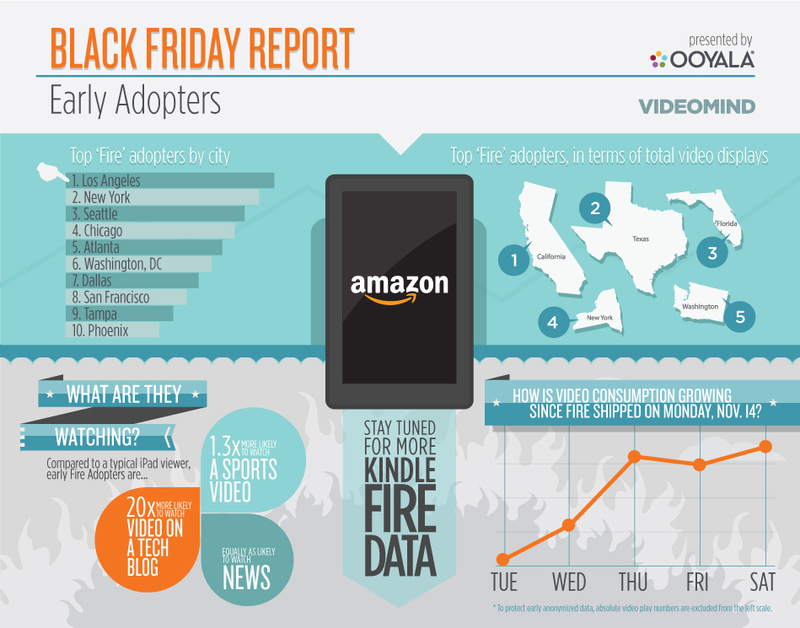 It has used that data to put together this infographic to showcase what Kindle Fire owners are watching. I’d like to know what if anything the iPad folks consume in greater quantities. My Fire has seen a good bit of stream through Netflix and Hulu. Amazon Instant is notably absent from that list because their pricing is just high enough, that I won’t rent/buy a video impulsively. I’ve primarily used the Fire for books, magazines and streaming radio. Interestingly, these are things I could have been doing for months/years with my Android phone/tablet, but generally didn’t. The Fire has done a great job of getting me to take the all important first hit. I don’t doubt that’s exactly what Amazon intended. I’m doing the same thing. A fair amount of Netflix. Stuff that I could have done on my laptop for years but almost never have. The modest sized screen is very convenient and appears quite sharp, so I watch content during breakfast or when I just feel like vegging out.